How can Age Action help with intergenerational projects? Intergenerational work is by no means a new concept; it has been around for decades however it has become increasingly popular in recent years. It is also now progressively more important in modern society with advances in technology and travel and where families are becoming more geographically dispersed. As a result of this, there is an increased focus on involving more people of mixed ages in local community action and increasing awareness of the benefits of age friendly communities. Intergenerational practice aims to bring people together in purposeful, mutually beneficial activities which promote greater understanding and respect between generations and contributes to building more cohesive communities. Intergenerational practice is inclusive, building on the positive resources that the young and old have to offer each other and those around them. We need your help! We are currently updating our intergenerational report from 2012, which mapped out 28 intergenerational projects across Ireland. We know that there are a lot more intergenerational projects happening in communities nationwide and we want to hear about them! This is a great opportunity for your project to be recognised and archived in a report that will be made widely available to lots of different stakeholders as well as online. It is also hoped that the information gathered will feed into policy, practice and research and put the importance of intergenerational initiatives on the map! Not sure if your project is intergenerational? Please fill in your project details in the online form available here or by spreading the word to your contacts. Please note - hard copies of the form are also available if you need one. Get in touch with Keelin McCarthy via the phone number or email below. 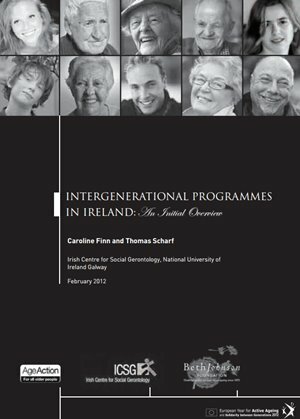 Note: Download the "Intergenerational Programmes in Ireland 2012 report" below. Develop and provide Intergenerational Resources, such as: The National Youth Council of Ireland, in collaboration with Age Action, Linking Generations Northern Ireland and Cathrina Murphy, launched a new chapter in their online Diversity Toolkit (Access all Areas) which provides guidance on carrying out Intergenerational work. While the chapter is aimed at those working in the youth sector, the information can be applied to all sectors in helping to promote intergenerational interaction and practice in your community. The Working across the Generations toolkit is available by clicking here. Watch three videos about Age Action's Generations Together projects here. Age Action has engaged in collaborative intergenerational work to help challenge ageism and prevent elder abuse, through a series of workshops and a report developed in conjuction with Cosc. We welcome any suggestions and ideas for the Programme so please get in touch if you would like to discuss an idea or if you would like some support for your project. If you would like to hear more about the programme and our ongoing work, please sign up to our newsletter by contacting us at the email address below.